This level has hard difficulty and you need to use good technique to complete this level. For this level you should try to play from the bottom of the board to shuffle candies everywhere and make special candy as you get the chance. Try to combine special candies to each other to break break more blockers and soda bottles to take bear to the top. Pretty much done – this level is impossible – I am moving in to other games. Playing consistently for three weeks. Impossible. Becoming bored. Probably moving on. Suggestions if played for one to two weeks should have option to move along. I feel the same as the players above. A game is no longer fun after weeks of trying. Like then,I am moving on. 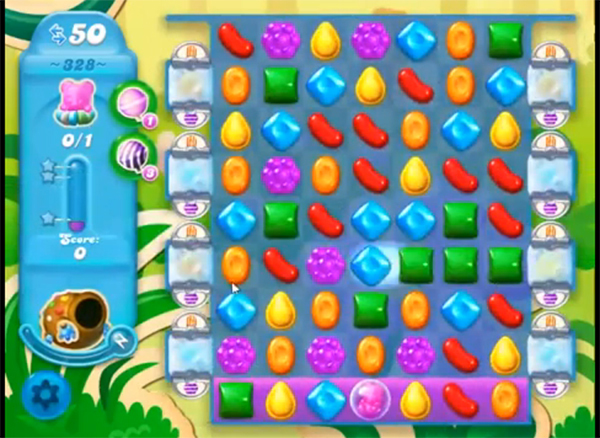 The harder levels require that the random placement and appearance of candies and more complex objects lines up just right. Like some types of more difficult solitaire games, the initial layout and subsequent appearances of candies, et al., has to be just right to have a chance of winning the level. I’ve played levels for two weeks without even coming close to winning, only to finally win with 10 moves left over. FreeCell is a solitaire game that technically has a path to winning in each layout (I usually win between 80 and 90 percent of my games), though you have to be looking many moves ahead to complete some of the layouts. Level 328 is not like that, but relies on a lucky and uncommon random configuration to win. You might get it on the first try, or you may never get it and d/l another game when you get bored. The level-design people at King seem to be their company’s own worst enemies, creating levels that simply turn off game players. Damn! Right after posting the comment above, I tried the level again. I got the bear up to the line with 3 moves left. I spent 15 minutes studying the layout and there was NO way on the board to get it across the beads. I tried the moves I thought would wreak the most havoc and perhaps get a break – no luck. Been on this for a month ! Been stuck on this for a month ! Why are some people given 50 moves to complete this level? I am only given 45. How do I increase my moves to 50? I can understand that you have to make these levels a little hard to do, but this is ridiculous. I’ve been playing this level for over a week and I can’t seem to get it. I try working from the bottom like the tips say to do, but that doesn’t help. Try making these levels a little less difficult to do.